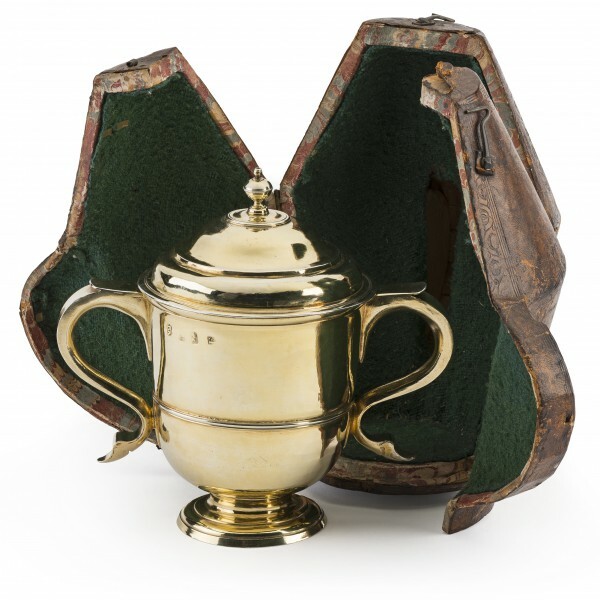 This re-discovered cup was gifted by Captain Thomas Coram (c 1668-1751), a seaman, ship builder, radical thinker and philanthropist, whose indefatigable efforts to relieve the suffering of London’s abandoned and starving children led to the establishment of the Foundling Hospital. 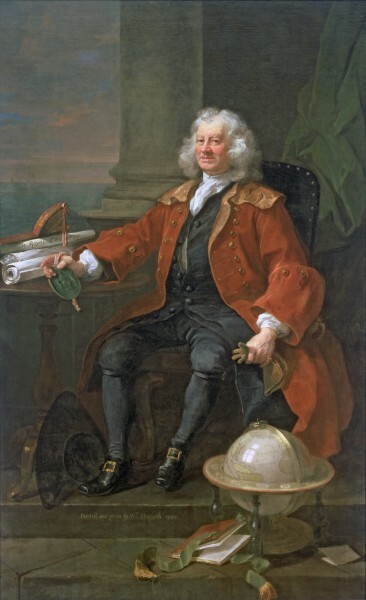 Born in Lyme Regis, Dorset, Coram went to sea aged just eleven before returning to apprentice for a shipwright on the Thames. In 1694, after impressing the admiralty and consortium of London merchants, he was put in charge of a new yard at Taunton near Boston, Massachusetts to build ships and secure sources of timber for the Royal Navy. For the next ten years he lived and worked in America but his success and abrupt plain-speaking manner attracted enemies, as did his staunch Anglicanism among his puritan neighbours. He was dogged by litigation, his ships were burned and there was even an attempt on his life. Nevertheless, he continued to espouse radical ideas such as land rights for the native Mohicans, an end to primogeniture and, later, the founding of a colony in America for destitute former soldiers. Coram continued ship building back in England whilst retaining an interest and encouraging investment in the American colonies. For many years he espoused various philanthropic schemes for the colonies including libraries, aid for debtors and support for Anglican missionary work. In London he campaigned for a lighthouse to be built at Boston harbour, his success showing the perseverance and talent for lobbying which led to his later achievement with the hospital. He was also a founding trustee of the new American colony of Georgia, raising funds and seeing off colonists although his objection to a restriction in women’s rights in the new colony led to his disillusionment and resignation. During the War of Spanish Succession (1701-14) he commanded merchant ships becoming captain. In around 1720, Coram, now comfortably off, settled with his American wife at Rotherhithe, an historic dockyard area populated by merchant seamen and ship builders. Whilst pursuing his business interests across town, Coram, childless himself, was appalled by the sight of abandoned children living and dying on the streets of London. 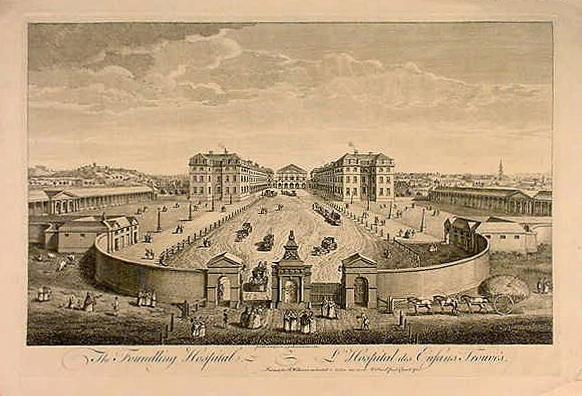 With characteristic zeal and determination, he set about promoting the building of a hospital for foundlings, modelled on examples on the continent. For years, Coram doggedly sought support and patronage for his scheme systematically soliciting support from London’s aristocracy but with little success. However, he did enjoy enthusiastic help from painter William Hogarth (1697-1764) forging a close association between the future hospital, art and artists. Composer George Frederick Handel (1685-1759) would likewise become a future governor of the hospital. Eventually direct appealing to the emotions of aristocratic women led to a “ladies petition” under the patronage of Queen Caroline and then, in 1737, to the signing, in front of Coram and Hogarth, of a Charter of Incorporation by George II. As this cup shows, one child was especially important for Coram, his own god son and namesake Thomas, born in 1720. Thomas was the son of William and Rebecca Corham of Kinterbury in Devon. 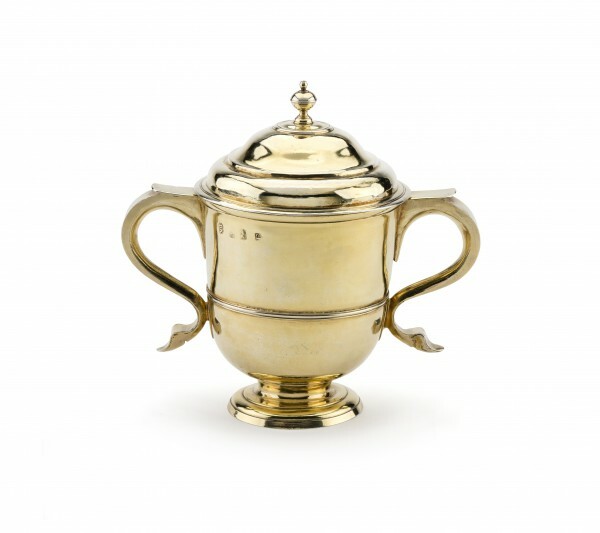 With scarce records, the direct link between the Captain Coram’s family in Lyme Regis, Dorset and the Corhams of Kinterbury, Devon is unclear although a family pedigree dated 1846 in the Foundling Hospital’s manuscript collection notes the gift of this cup between the families. 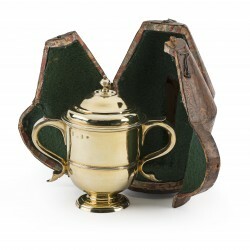 The cup is also referenced in an early history of the hospital [Brownlow, John Memoranda; Or, Chronicles of the Foundling Hospital Including Memoirs of Captain Coram &c, London 1847] when it was, with other family relics, in the ownership of a Mrs Thomasine Shepheard of Plymouth, Devon. She was said to be a “grand-niece of the Founder of the Hospital” so it is reasonable to assume not only that she inherited the cup from her father Thomas Corham but that he in turn was Captain Coram’s nephew. Such a lavish gift illustrates the importance of the relationship between the families but above all the cup is a touching tribute from the founder of England’s earliest and most famous children’s home to a child he loved. Acquired in 2015 by The Foundling Museum, London for the permanent collection with assistance from private donors.